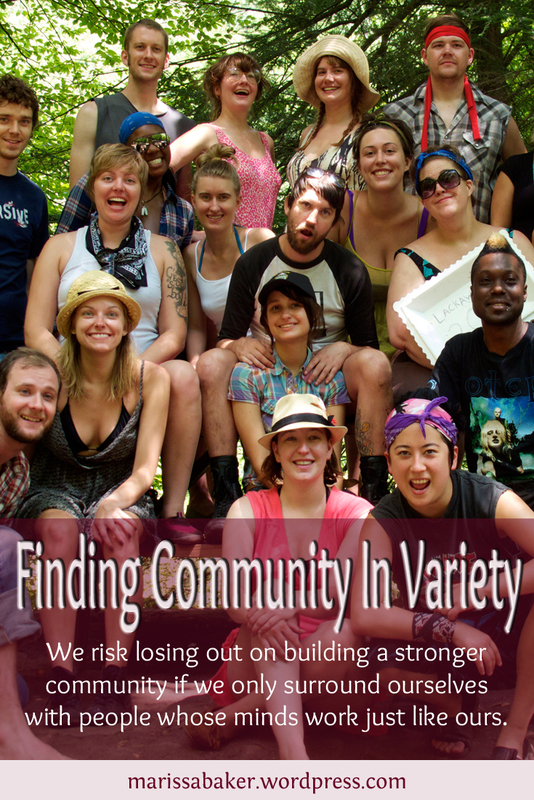 For those with rare personality types, though, it’s hard to find communities of like-minded people. Only about 30% of the population is made up of Intuitive types, and among those INTJ and INFJ are the rarest. How do you find community when only 1-4% of the world’s population thinks like you? The internet has opened a marvelous world of inter-connectivity that’s not tied to location. Whereas only 1-4 people out of every 100 you meet in real life might be INFJ, you can go online and find groups of them gathered together from around the world. Same for other personality types. Track down some bloggers who share your type and start commenting on their posts if you want to get a dialogue going with people of your type. Let’s talk about The Avengers again for a moment. How do you think that team would work if every single person thought the same way Tony Stark does? a team of ENTPs could come up with some truly world-changing ideas, but there wouldn’t be anyone to keep them grounded in reality or hold them accountable to human society. On the other hand, would an entire team of Steve Rogers be much better? a group of ISFJs would be far more effective protectors, but they’d also have a hard time adapting to new situations and run the risk of losing themselves in trying to save others. The rest of the team is also a mix of types, including ISFP Scott Lang, ISTPs Black Widow and Hawkeye, ESTP Bucky Barns, and INxx (introverted intuitive something) Bruce Banner. We risk losing out on building a stronger community if we only surround ourselves with people whose minds work just like ours. If you always agree with the people around you, you’ll never learn to respectfully engage with those who challenge your ideas. If all your friends enjoy the same activities you do, you’re never pushed to learn something new. If the people around you all think the same way, you’ll ignore alternative solutions which might work better. For example, when my siblings and I put our INFJ, INTJ, and ENFJ heads together we can generate some pretty innovative ideas, but our ISFJ father is much better at coming up with elegantly simple solutions (that actually work) to every day problems. Even within groups that share a common interest variety is a gift. Take the church for example (since this is as much a Christian blog as a personality type blog). God didn’t intend for the family He’s building to exclude any personality types. The mix of personality types within the churches is a strength. You have something in common — belief in God — and learning to work within a common framework with different personalities strengthens community. With the mix of personality types, you get people who are naturally good administrates, who connect emotionally with others, who exercise hospitality as easily as breathing, who can rationally handle finances, and a whole host of other skills. Our differences provide an opportunity to create a balanced community that promotes growth. Great post! Thank you for stressing the importance of fostering community with those who think differently. That’s something I’ve learned to appreciate over the past few years. I am an INFJ, and I find that I most naturally am–by far–drawn to INTJs (I even married one), and I have been my entire life. However, I’ve really struggled to converse easily with INFJs. Maybe it’s because we’re introverted? I’m not sure why, but conversation just doesn’t flow the way it does with INTJs. What about you? With which type do you most easily converse (in person)? Are you naturally drawn to a particular type? ENFJs. I find them incredibly easy to talk with and I love being around them. We think enough alike that it’s easy to communicate, but their extroversion draws me out in a way I’m more comfortable with than when talking to most other extroverted types. I also connect really well with INTJs and INFJs (but am less likely to maintain a close friendship with the INFJs I meet. More like sporadic conversations). Thank you for responding. I realized my error in suggesting the difficulties when talking INFJs could be their introversion, when I had previously said I do well with other introverts (INTJs). Do you know why you’re less likely to maintain close friendships with other INFJs? Not entirely sure. It’s not like I’m actively pushing them away, it’s just that I don’t really think about contacting them unless I have something specific I want to talk about. And it seems they do the same thing.